When I got home, I opened the shutter. Gently lift the speed cam so as to not dislodge the cocking ring (which isn’t difficult to reset, but better to leave things alone until they need to move). The escapements for the slow speeds and the self timer required little work. 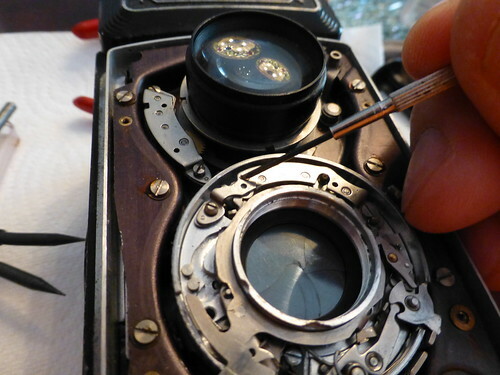 I know many people are proponents of “dip and dunk” shutter cleaning. I’m not. 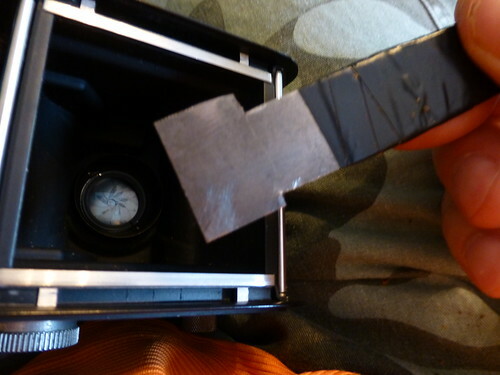 I find that dunking seems to let all kinds of nastiness migrate into parts of the shutter where it shouldn’t go. In cases of extreme dirtiness, I’ll remove pieces as far as necessary, then swab the interior clean. 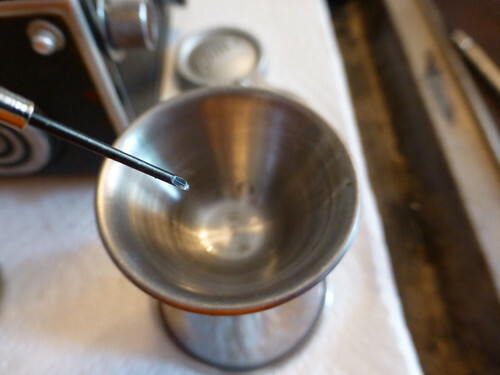 A difference – I generally use straight xylene, rather than Ronsonol/lighter fluid to clean parts. I’ve found it’s a little more aggressive with old oils and grime. I always start conservatively with shutters, dripping small amounts of xylene off a small screw driver onto pin shafts in the escapements (or anywhere a rotating part is binding). Not a flushing, just enough to wash down the shaft. If the parts remain free after the xylene dissipates, I’ll move on. 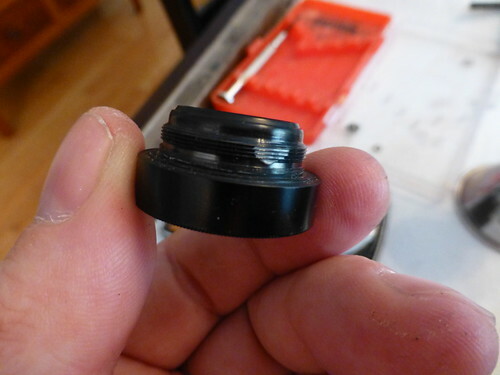 If things refuse to improve, I’ll remove the part for ultrasonic cleaning in xylene. Small disclaimer: Xylene’s bad for you. Carcinogenic bad. Don’t breath it; wear gloves, use common sense. Don’t blame me. You’ve been warned. This shutter responded well to the conservative treatment. 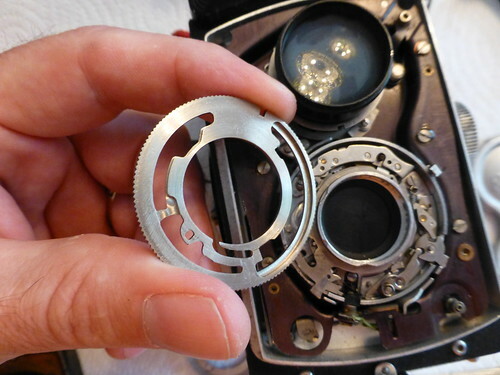 The slow speeds are running a little long, and an adjustment can be made by sliding the escapement in towards the center of the shutter, but I’ve found doing this often creates more problems than it solves. 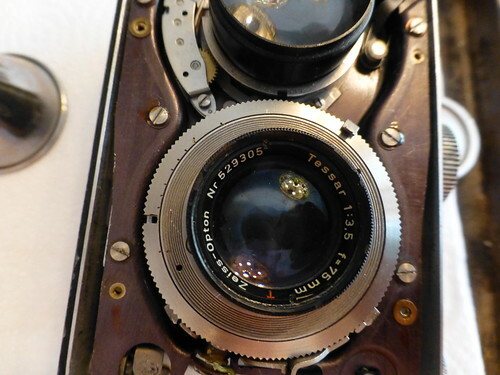 The speeds are within 30%, which is fine for print film, and likely slide film. I’ll test before I move the escapement. Compur Rapid shutters were designed to run dry, but I’ll often hang a very small drop of Rem oil (a light lubricant) off my smallest screwdriver and apply to the pin shafts in the shutter. The speed cam and cover plate are then replaced. 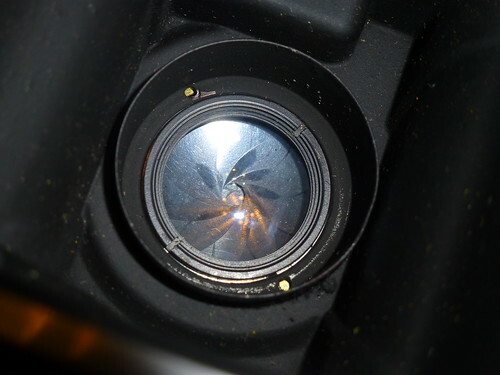 When installing the speed cam, rotate gently back and forth to make sure all the tabs within the shutter, which ride on edges of the cam, are seated properly. 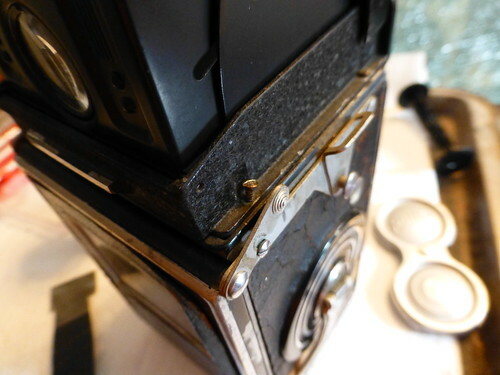 Check for gaps around the outside of the shutter between the cam and body. If there’s a gap, something’s not seated properly. 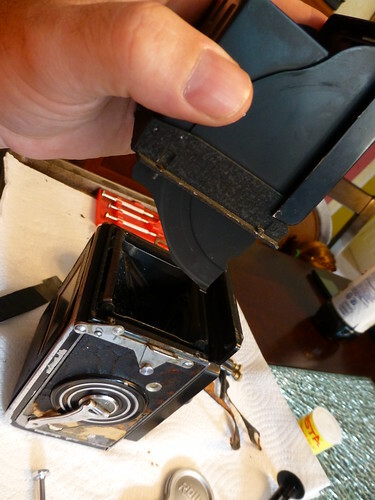 I apply a very, very thin coat of Teflon grease to the underside of the cam and the outer plate before installing. The cleaned front cell goes in next. 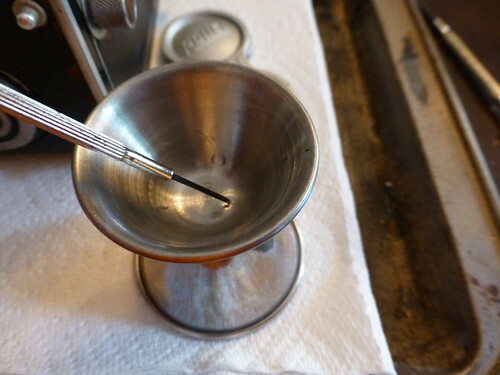 Again, I apply a very slight amount of the Teflon grease to the threads to aid in installation, and to prevent seizing. 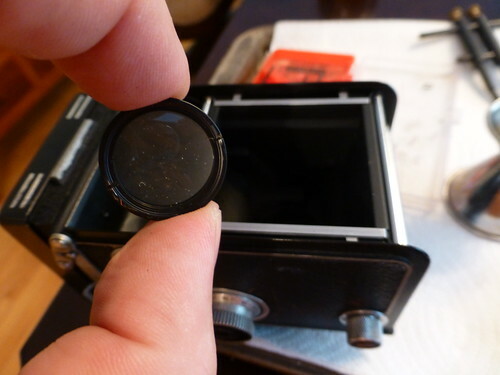 Adjust the aperture and speed ring on the shutter to match. When you install the cover, you may need to gently rock the wheels back and forth to seat things correctly. Make sure your shims are in the proper places, then screw down the plate. 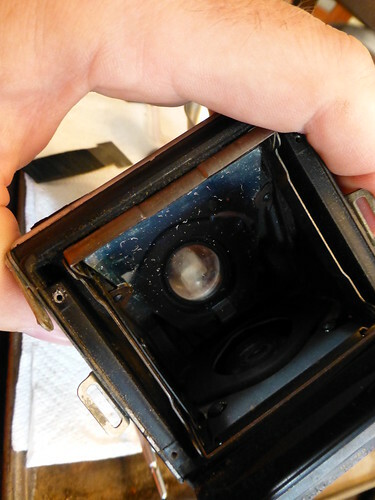 Next, I remove the inner cell of the taking lens to clean the front and rear surfaces. 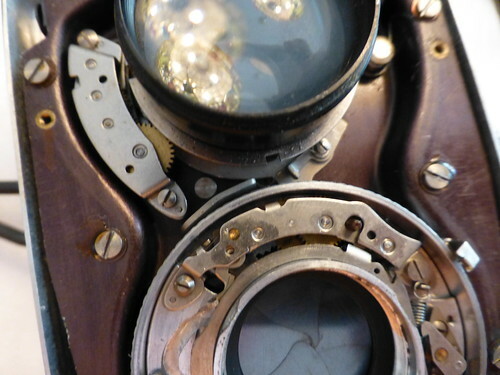 I have a special tool for this, cut from a woodworking cabinet scraper, which spans the lens and seats in the two notches on the cell. The glass is again cleaned with microfiber cloths. This glass cleaned nicely. A little grease on the threads, and back in it goes. I then removed the hood. Four screws hold it in place. Surprisingly, the mirror is in very good shape, needing only some very light cleaning (the front-surface mirror is easily damaged). The hood is a little cockeyed, and pivot points need some lubrication. 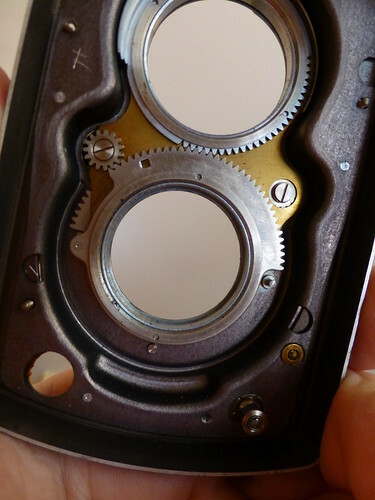 I gently realigned the sides so the viewer pops in and out correctly; lubrication will have to wait. 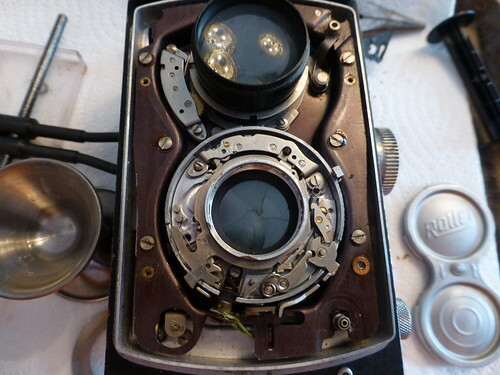 This entry was posted in Repairs and Rehabs, Rolleiflex AUtomat K4/50 and tagged 6x6, automat, compur rapid, rehab, repair, restoration, rolleiflex, shutter by scottperryphoto. Bookmark the permalink.